“You have 60 seconds left on this phone call,” blurts the automated voice. It’s an irritating reminder of where I live. When I talk to my daughter on the telephone, my confinement in prison fades into a vague reality. The 60-second warning yanks my consciousness out of the mirage my surroundings have morphed into. I’m not in the park pushing my daughter on the swing, listening to her melodic laughter on a warm, sunny day. I’m in a cold, drab and hollow institution. “Daddy, are you calling back?” My daughter’s voice booms with eagerness. I glance at the long line of other prisoners waiting for their 15 minutes of peace — the maximum length of a prison phone call. “Sorry, princess,” I sigh. “I’ll try to call you tomorrow.” I sense her shoulders slump as she mumbles, “OK.” The sorrow in my baby’s voice crumbles my soul. I endure trials like this every day in prison. When weighing the risk of our actions, many of us involved in the streets are unaware of the scope of difficulties and frustrations we will experience in prison. My experiences and observations in prison have shown me that prison is far too severe a risk to participate in the street life. I’ve seen several men stabbed in prison with homemade knives, and their cries of pain weren’t nearly as torturous as this one. I looked around and discovered a man who dropped the phone he was on and fell to his knees crying hysterically. He hadn’t seen his mother for the past eight years of his incarceration, and he will never see her again. The prison denied his request to attend the funeral. Instead of being there with his mother, he was locked away in prison because of his choice to sell drugs. An acquaintance of mine, a strong-minded and intelligent man, was placed in the prison’s notorious Administrative Control Unit, intensive solitary confinement where you don’t see anyone and you don’t hear anyone. It’s just you, silence, and your regrets cooped up in a cramped cell. When you do hard time, you force your loved ones to do hard time with you. The young man lived in that condition for nearly two years. His next cell was in the Mental Health Unit. The extensive solitary confinement broke him. He paced back and forth in his cell stark naked, sculpted figurines out of his feces or devoured it, and had hallucinations of tiny people scurrying around his cold dark cell. If he refused his psychotic medication, about eight burly prison guards in riot gear would storm his cell, pin him down, and forcefully inject his medication. His chilling screams and pleadings to stop echoed throughout the entire cellblock. This young man made a choice to risk coming to prison by robbing somebody. He didn’t realize he was risking his sanity. Once a strong-minded man, he is now a tormented soul, a pitiful sight to see. When you choose to commit a crime and end up in prison, your loved ones are also affected. Mothers sit in prison visiting rooms depressed and crying while their sons sit there stoically, straining to conceal the anguish and regret they feel for bringing this suffering upon their families. Families put themselves in the poor house. They pay thousands for lawyers and hundreds for gas to travel long distances to visit loved ones in prison. Younger brothers who looked up to their big brothers for guidance feel abandoned, resentful and lost. Their big brothers left them for prison. Fatherless sons have no one to teach them how to be a man. And fatherless daughters go searching for a daddy in a boyfriend, finding only heartache and pain. When you do hard time, you force your loved ones to do hard time with you. The prison experience also includes cavity inspections, getting strapped face-down on a restraining board, enduring the putrid stench of a cellmate using the toilet only three feet from the bed, and eating sickening food prepared by inmates who may have spit or worse into the food trays. 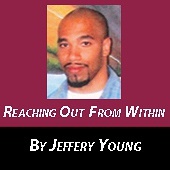 Jeffery Young welcomes reader responses to Jeffery Young #213390, 7600 525th St., Rush City, MN 55069.